Norfolk Catheter Lock Solution NV-TCS01. 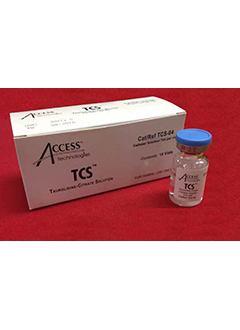 The TCS contains anticoagulant and antimicrobial substances. It is to be used with a vascular-access-port. It is to be instilled inside the device between treatments in order to maintain device patency by making the internal flow passages resistant to clot formation and hostile to bacteria and fungal growth. The solution must be withdrawn prior to fluid infusion or blood withdrawal. In the event that patency is compromised, follow your facilities protocol for restoring flow. TCS has no fibrinolytic activity; therefore it will not lyse existing clots. Active ingredients in TCS are taurolidine and citrate. Other components include water for injection. The pH is adjusted with citric acid and/or sodium hydroxide. The product is sterile filter processed and supplied as a clear, sterile, non-pyrogenic solution. Each single vial contains 7ml. Non-Toxic Formulation. Does Not Induce Development of Drug-Resistant Bacterial Strains.